As the second largest city in Washington, Spokane needs preservation services D&R Masonry Restoration can provide with skill and careful consideration. Our job is to help keep your property staying strong over time while keeping its integrity. With a large city comes many buildings which each require individual attention. At D&R Masonry Restoration we have the know-how to understand which services a busy commercial property owner can get the most use out of. Our projects are cost-effective, timely, and always done to the highest standard. Allow us to keep your Spokane WA structure in great shape. Traffic & Pedestrian Deck Coatings – If you get a lot of foot and car traffic, we’ve got options for you. These deck coatings are made to be skid-resistant, strong, and waterproof. They also can stand up to climate, moisture, chemical, oil, gas, wear and tear, deicing salt, and more. Parking Deck Repairs & Coatings – Parking decks need to be able to work for as long as possible while still being functionally and cosmetically good. That’s where out parking deck repairs and coatings come in! We can fix up cracks and install a capable coating to handle everything your parking deck goes through on a daily basis. Your site can’t go down for days during construction, so we work as quickly and efficiently as possible to tackle areas at different times. Seismic Reinforcement – Seismic reinforcement is a must for older properties in the Pacific Northwest. Historic sites are charming but not made to withstand earthquakes, soil failure, or general shifting. Our team treats vintage structures with care while getting the job done right. Exterior Building Cleaning – No one wants dirty buildings to house striking works of art – you shouldn’t want an unsightly structure for your business either! We choose the right cleaning service for you based on the problem areas your site has. Graffiti Removal – Spokane’s gang graffiti is an ongoing problem. The city takes the issue very seriously and so do we. We understand the care and thought that must go into removal. If the wrong solvents and/or techniques are used, property can be damaged instead of helped. We’ll get rid of the vandalism quickly and well. Spokane Valley has a charming mix of classic and modern architecture. The services we offer won’t just strengthen your Valley building but bump your pre-existing elements up a notch! Façade Stabilization – Keep your veneer standing tall with façade stabilization. We can put in anchors, repairs, and support between your façade and your structural wall to keep everything secure. Epoxy & Grout Injection – Epoxy and grout injection can be targeted just where you need them for strength and protection that blends right in. Carbon Fiber Strengthening – Carbon fiber strengthening can be particularly useful for sites that have deteriorated, are going to be changed from industrial to educational (for example), and/or need more reinforcement capabilities. This service doesn’t work with unnecessary pressure, can be specially fit to the exact spaces, is alright under many conditions, and looks great. Stone Restoration – We can take your stone up a notch with our restoration techniques. Our crew can do a wide variety of finishes including: honed, leathered, flamed, sandblasted, brushed, and polished. Each one gives your surface a different feel. From rustic to modern we can achieve the look you what. Air Barriers – Both older and newer buildings can deal with poor air flow. Air barriers work against that by providing controlled air intake through the interior and exterior of the structure, helping with heating, giving more life to your materials, and more. Roof Coatings – Roof coatings can do more than you might think. In terms of climate, they fight sun damage, water damage, and allow your heating and cooling costs to be more efficient. By acting as a durable barrier, they also increase overall longevity and create a more pleasing surface. 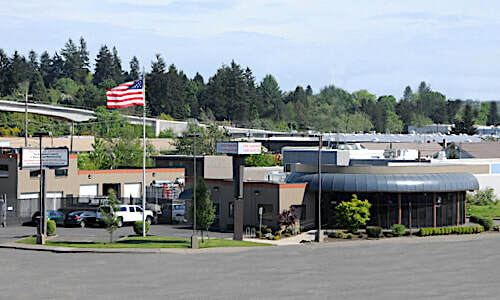 D&R Masonry doesn’t just keep properties looking fantastic in Oregon – we’re all over the Pacific Northwest! Named for the Native American Coeur d’Alene People, CDA is a satellite city of Spokane and makes up part of the Spokane-Coeur d’Alene Combined Statistical Area. For years the “Lake City” has rapidly been growing in size and tourism due to its history, resorts, Christmas celebrations, and beautiful nature. We want to keep expansion up with our variety of restoration and protective services. Building breakdown doesn’t encourage new growth, but preventative measures allow for years of prosperity. Exterior Coatings – Exterior coatings are a valuable service for any building as they both protect and preserve. They stop poor water drainage while also keeping up your property’s integrity, which means saving possible costly repairs and refinishing down the line. Above & Below Grade Waterproofing – Above and below grade waterproofing is a specialty of ours. We have done it countless times for numerous projects and can find the best solutions for your needs with tools like bentonite, caulking, and blue skin. Hot Waterproofing – This method of waterproofing uses hot rubberized asphalt and it best applied on flat surfaces for a sleek, seamless look. Masonry Restoration – If you know you need restoration work we can create plans for you and walk you through the entire process from start to finish. Caulking – Caulking acts as the first line of defense against water damage. This means it has a lot to go through with even a little bit of potentially harmful snowfall. Over time it begins to break down. The D&R Masonry Restoration team can take away old caulking, install new, and give you greater peace of mind. Concrete Repair – Broken concrete is not attractive and can create structural hazards for your commercial property. We can deal with cracks, spalls, and gaps in your surface effectively so they are not only fixed, but simply better for the future. Whether you need restoration work in Spokane, strengthening and upgrading in Spokane valley, or protective services in Coeur d’Alene, we have able experts ready to assist you! call D&R Masonry Restoration today!